That Magnificent Little Ship A tribute to the MacGregor Classic 26' Sloop By Buck Graham In 3,000 miles from Santa Barbara to Costa Rica you can get to know a boat, and by that time you either hate it, tolerate it, or love it. 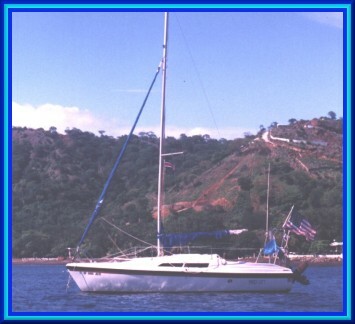 Fifteen years ago, I made the same trip from California to Costa Rica in a 22' MacGregor-Venture and described it as "Sea-friendly". The story of this trip, "Follow Your Dream" was published in Western Boatman in February, 1985. "WIND GIFT", a MacGregor Classic 26' Sloop, is also sea friendly, and its' performance along the way has to be called awesome. The trip was a 3,000 mile love affair. To me, it is awesome to lash the tiller with balanced sails and have the boat sail on track until the wind changes, sometimes for days! i single-handed "WIND GIFT" and depended on the superb balance of the MacGregors rather than the use of wind vanes or auto pilots. Back in stateside marinas i was always witnessing the avid sailor ho took his small sail boat sailing every week. When that day came when he "moved up" to a larger boat the frequency dropped to maybe just a few times a year. Boats the size of "WIND GIFT" are a joy to sail, and easy to handle and maintain. So how about a long trip? Off-shore? With storms? God provided some chubascos to show me how "WIND GIFT could handle wind. Off Champerico, Guatemala, one hit, with 45 knot winds, gusting to 60. I was putting a third reef in the main, but gave up and bare poled it, hiding out in the cabin, watching the GPS. I thought I was heading for rocks, five miles away. I used the outboard to turn the boat and head out to sea. "GIFT" was riding beam to the weather on a lashed tiller, making 2 - 3 knots away from the rock. In those storm-tossed seas, "GIFT" had an easy ride. A gentle pitch; a yaw to the left. A wave rolled under (the keel was up) and "GIFT" gentle yawed to the right, with a gentle ten degree roll. It was about one-fourtha s fierce as the bow waves of the sport fishing fleet when "GIFT" was at anchor in Cabo San Lucas. In the next chubasco I sailed under a reefed main. "GIFT" had a fifteen degree angle of heel, and was making about 5 knots on a reach in 25 knot winds, on a lashed tiller. In another chubasco, I sailed under a reefed jib - no main. I was amazed how well "GIFT" points to weather under only a jib. When I got caught in a gale in the 22' Venture it was the same story. An easy ride, gentle angles of heel, and a lashed tiller. I suspicion the MacGregors bounce and bob a lot. This is why they never take seas over the deck: they are always on top of the water. I have watched my MacGregors at anchor when I am ashore, and I'm always surprised by how much they bounce. Then I surmise they must do that when I am on them... I'm just used to it. I probably reef soner than most sailors. A racing sailor would suffer severe circulatory deprivation sailing with me. But as a cruising sailor, I like to take it easy on the rigging, especially when replacement parts are 6 months away. So what improvements did I make to "GIFT"? Not much, really. When I re-rigged it, I went to a size larger cables for the standing rigging. Not for added strength, but for added meat to feed the corrosion bugs. And turnbuckles, because they are easier to adjust on the water than the spacer plates. The wire going to the light on the mast clanged like a bell until I ran those foam rubber tubes that are used to insulate water pipes over the wire. The rudder rattled until I plled up the rudder post a bit to wrap teflon tape around it. (The same stuff a plumber would use to seal pipe threads) The keel lifting tube spat water on the batteries until I extended the tube to sink level. I use 1/4" nylon line instead of stainless steel cable for the keel lifting rope because the swages for the stainless steel cable last only about two weeks when the boat is in the water all the time. My present rope has been in there for seven months now, with no sign of wear. 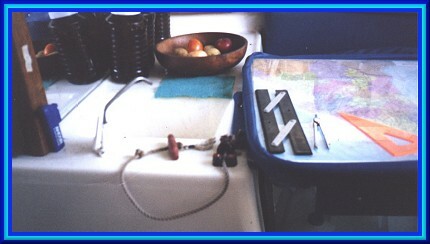 Extending the tube and rope to sink level makes it easier to replace the rope when it does break. "GIFT" has duplicate solar panels, each charging its' own battery. A voltmeter tells which circuit is the most cheerful. I designed and build shelving that buttons into the slot between the hull liner and the overhead liner. No holes had to be drilled in my precious boat. I added Harken roller furling for the jib. A real blessing! MacGregor designed the mast to be lowered and raised for easy trailering. This is a terrific advantage for the cruising sailor! The swing keel, also designed for the trailer, adds a new dimension to the art of sailing. I call this "swing wing sophistication". The boat can be redesigned for every point of sail! Sometimes, the sails are happiest on a reach. My desired course may be a little more off the wind. Compromise is reached by giving the sails the angle they want, and cranking up the keel allows me the leeway to give me the course I want. The down-wind machine has only a foresail, keel up, and a lashed tiller.It is really a big surf board, singing happily on the forward slope of waves for 20 seconds or more. The keel goes down only when working to weather, less than 90 degrees off the wind. I started the trip with an 8 HP Honda, which is a good cruising motor using 1/2 gallon per hour, and 10 miles per gallon. My Honda died in Huatulco and I replaced it with a two-stroke, which is not a viable cruising motor, at 5 miles per gallon. Hondas don't grow in Huatulco. I wrote this story as a tribute to "WIND GIFT", that Magnificent Little Ship, and also to MacGregor Yacht Corporation, for an outstanding boat. I am volunteer simplistic. The MacGregor is a solid, basic boat, superior to many in sailing and safety characteristics. This, along with the swing keel and positive foam flotation, made it my choice for a cruising boat. HOME Or have a look at the old front page Where this site, and preparation for this story began.